Overview: Never let it be said that Peter Parker’s life is easy, in or out of the Spider-Man costume. This book opens with the (then) shocking death of Captain Stacy, who reveals with his dying breath that he knew Peter’s secret all along. Before he (or Gwen) can recover from that, a handful of familiar foes come back to keep Spider-Man busy, such as the Beetle, Doctor Octopus, the Green Goblin, and the Spider Slayer. For issue #100, Peter tries to put his scientific knowledge to good use in an attempt to rid himself of the powers. In typical Parker fashion, the serum backfires, and instead causes four new limbs to appear on Peter’s body, making him a true Spider-Man. That takes Peter to call on Dr. Curt Connors, which means the Lizard is not far behind. And this story also introduces a new villain that would become a key player in the Marvel Universe: Dr Michael Morbius, who specializes in blood disorders by day, and haunts the nights as a living vampire. What makes this Essential? : The more I revisit this book, the more I think this is truly an essential Essential. We see Stan Lee turn over the writing chores for the title to the new generation of comic writers, first to Roy Thomas and then to Gerry Conway. We see real relevant topics pop up in the stories, such as drug abuse or the struggles of vets returning from Viet-Nam. We are introduced to Flash Thompson’s girlfriend Sha Shan, which may be one of the first interracial relationships in comics. The art in here, from Gil Kane and John Romita Sr., remains spectacular, to borrow a familiar adjective. Between this volume and the next Essential, these may be the best Spider-Man stories since the end of the Lee-Ditko run of the early 1960s. Respect My (Comics Code) Authority: In the early 1970s, the U.S. Department of Health, Education, and Welfare approached Stan Lee about doing a story in comics that showed the dangers of drug abuse. Lee agreed, and worked the story into his ongoing run on the Amazing Spider-Man. In issue #97, Peter Parker’s roommate Harry Osborn turns to drugs in an attempt to handle the pressures of life. The Comics Code Authority (CCA) rejected the story back to Marvel. Lee felt that the request from the government overruled the decision of the CCA, and published the issue without the CCA seal on the cover. The story earned great praise, and it forced the CCA to revise its guidelines. Footnotes: Amazing Spider-Man #92 is also reprinted in Essential Classic X-Men Vol. 3. If you like this volume, try: David Hajdu’s book, The Ten-Cent Plague: The Great Comic-Book Scare and How It Changed America. Hajdu is a historical researcher who focuses his attention on pop culture subjects of the 20th Century. In this work, he dives deep into the world of comic books from the late 1940s to the mid 1950s. He looks at Fredric Wertham’s Seduction of the Innocent, and how it impacted the subsequent Senate hearings and the comic book industry. While it focuses more on Bill Gaines and his EC Comics, the impacts of this era led to the Comics Code Authority, and the self-censorship of American comics by the publishers. The faults of the Comics Code Authority is seen quite clearly in this Essential volume, with the Harry Osborn drug issues and the creation of Morbius, a “living vampire”, because undead vampires were not allowed at this time. IWhile the tide was changing in the CCA offices, these stories from Marvel certainly helped to see the CCA revise their guidelines, allowing for the classic monsters such as Frankenstein and Dracula to appear in comics, and allowing drugs use to be shown in a negative light. This entry was posted in Marvel Essentials, Spider-Man and tagged Gerry Conway, Gil Kane, John Romita Sr., Roy Thomas, Sal Buscema, Spider-Man, Stan Lee. Bookmark the permalink. 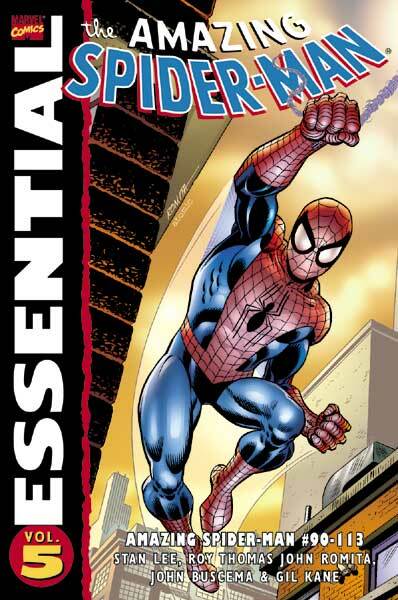 Pingback: Throwback Thursday – Essential Spider-Man Vol. 5 – WORST. COMIC. PODCAST. EVER!